When Adobe asked me to explore the theme of ‘Multilocalism’, one of the Visual Trends the company identified for 2018, I immediately understood its context. Multilocalism looks at the theory that technology and travel are turning the world into a global, interconnected village. Growing up in London with a Filipino-Spanish background, as well as living in and experiencing life in different countries, has made my concept of where I come from quite fluid. I feel as much a part of Philippine culture as I do British culture – even if there are glaring gaps in my Filipino knowledge, a symptom of growing up in the West. As a teen, this confused me and made me feel a little bit lost at times. Today, it empowers me. Speaking in a broader sense, anywhere we travel to today has past and present cultural influences, whether encouraged by colonisation, immigration, assimilation, or globalisation. Cultural influences touch every aspect of the world around us, especially when it comes to food. Jollibee, which is Phillipines’ most popular takeaway, is opening in Earl's Court, London. Likewise, Waitrose and Costa Coffee already exist in Manila. I loved creating these images for Adobe’s Multilocalism project, because it’s allowed me to visually explore my own ideas of home and identity. I was also able to translate what Multilocalism means to me, through Photoshop, to share my views with the rest of the world. Without further ado, here are the steps I took to create my images! "Manila Streets meet Tower Bridge"
In this visual, entitled “Manila Streets meet Tower Bridge”, I am pictured wearing a barong, a traditional Philippine pineapple-weave formal shirt, and holding a traditional parasol umbrella along with an oriental fan and flip-flops (worn on a daily basis in the Philippines), walking alongside an iconic colourful Jeepney (symbolic of Metro Manila’s chaotic traffic, sourced from the web) passing through London’s iconic Tower Bridge at sunset. I sourced the Tower Bridge asset from Adobe Stock. Step 1. I opened this image of myself with a barong tagalog, parasol and oriental fan in Photoshop. Using the Quick Selection tool, I traced roughly around my silhouette and then hit ctrl+J to create a cut-out of myself from the existing background layer. Step 2. I then opened up the eraser tool and zoomed into the cut-out, cleaning up any stray bits of background. Step 3. Once I had a nice, clean-cut silhouette, I opened up my chosen Adobe Stock image of the glorious Tower Bridge at sunset. Using the pointer tool, I then dragged the silhouette layer into the new open image. Step 4. I moved my silhouette around a little bit to find a place that looked most natural for me to be strolling along at sunset. Once it was placed, I opened up the Camera Raw Filter to start tweaking the light source and colours of my silhouette, so they’d match the warmth of the existing Adobe Stock image. Step 5. Using the Magic Wand tool, I selected my edited silhouette layer and then clicked on the Background layer. I hit ctrl+J again to create a cut-out of the Background layer in the shape of my silhouette. I then laid this on top of my silhouette and changed the properties of the layer from Normal to ‘Multiply’. This helped achieve a translucent effect for my barong, parasol and fan. Using the eraser tool, I then erased the parts of the layer that should have stayed opaque (such as my legs, my skirt, my face, etc). Step 6. Returning to my original image file, I selected the Magic Selection tool again and cut out my shadow from the floor. I then pasted the shadow onto the new visual, matching it up with my silhouette, and changed the opacity to 86% and changed it to ‘Multiply’ so that it matched the stock image better. Then, I rotated the shadow to match the direction of the sunlight. Step 7. I then hit ctrl+L to bring up Levels, which helps to adjust light and shadow. I tweaked this until my silhouette looked a bit more realistic as part of the image. Step 8. Next I imported an existing photo of a classic Philippine Jeepney, a local sort of colourful bus that has been built from various parts of various different cars, and cut it out using the quick selection tool. I placed it on the road, so it would look as though the Jeepney is thundering along Tower Bridge. I then used the Camera Raw Filter to adjust the colour and sharpness of the Jeepney, to match the image. Step 9. To make the image look more realistic, I then used the magic wand tool to cut out the railing from the background layer and hit ctrl+j to make a new layer from the selection. I then laid this layer on top of the Jeepney. Step 10. Finally, I added an extra layer to mimic the shadow of the Jeepney, and gave some final colour tweaks to the whole image, so that it looked bolder and brighter. I also toned down the white highlights on my legs using selective colouring, and increased the shadows using the burn tool. For this visual, entitled “Britain goes to Bohol”, I merged the quintessentially British ritual of afternoon tea during summer time with a gorgeous moving image reminiscent of Bohol, a beach island in the Philippines, sourced from Adobe Stock. I thought the juxtaposition would be funny, and I love how this creation turned out. Step 1. I imported an image of myself in traditional British ‘afternoon high tea’ wear – light summer dress, a fancy hat, pouring tea from a teapot into a fine china tea cup on a saucer. I traced my silhouette with the quick selection tool, then inverted selection and deleted the background. Step 2. Using the eraser tool, I zoomed into the image and cleaned up the silhouette. Step 3. I then imported a beautiful beach paradise video from Adobe Stock, reminiscent of the island of Bohol in the Philippines, famed for its bright blue waters and glorious white sands. Step 4. I pasted my silhouette layer into the image and hit ctrl+t to resize it. I then moved my silhouette around until I found a spot on the sand that looked relatively realistic. Step 5. I cropped to a vertical 4:5 aspect ratio, so that it would fit onto Instagram. Then I thought, what afternoon tea would be complete without scones, jam, sandwiches and cakes? Step 6. I cut-out an image of a tea table and placed it on the sand alongside my silhouette. I then imported a traditional afternoon tea set laden with cakes and sandwiches, as well as some scones with jam, and resized them to fit on the tea table. Step 7. Last but not least, I imported an image of a Union Jack (British flag) rug and placed it under the table on the sand. Because the animated water overlaps the rug, I used the burn tool to make it look as though the rug was slightly damp at the top. Step 8. The last thing I needed to do was turn the whole PSD file into an animation. Working with the existing Adobe Stock video, I merged the image layers and opened up the Timeline window to create a frame animation on permanent loop. Step 9. Then I hit file > export > render video, to export the file as a video. It was a pleasure to collaborate with Adobe on something as meaningful and creative as the Multilocalism project. 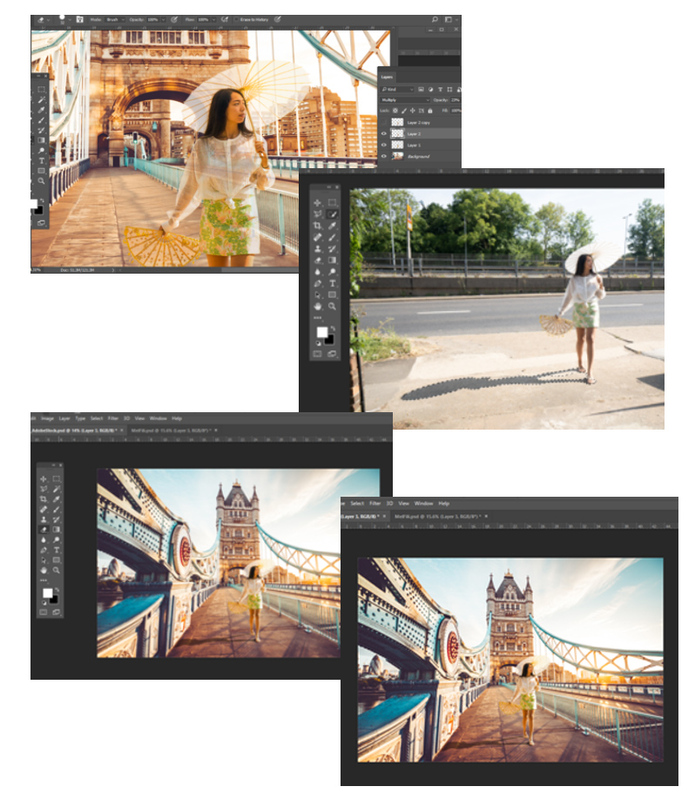 Have a go at making your own multilocal image by downloading and using 10 free assets from Adobe Stock and tell me, what would you create? Check out more information about the Multilocalism trend on Creative Connection.